The PRI, The Generation Foundation and UNEP FI have launched a series of roadmaps as part of the Fiduciary Duty in the 21st Century initiative. The publications are the culmination of extensive consultation with regulators, investors, policy makers and attorneys across the countries. They make a series of recommendations to enable the market-wide adoption of ESG integration. The recommendations address the following core areas: corporate reporting, shareholder engagement, investor education and regulatory change. In 2016, the Australian, US and UK roadmaps were launched to advance fiduciary investment practice in these major pension markets. Roadmaps for Brazil and Canada were launched in early 2017. 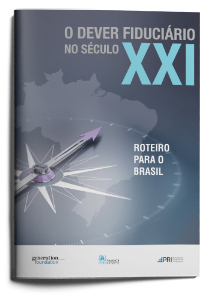 Download the Brazil Roadmap in English and Portugese.